Whether you are new to the city or a local who enjoys eating out, Barbeque Nation might always be on the tip of your tongue. Never losing out on its charm for killer food and impeccable service, we hit its latest joint in Alcazar Mall. Barbeque Nation runs full-house during lunch and dinner, every day. With four branches in the city, it opened an outlet in Alcazar Mall, Jubilee Hills around two months ago and we finally decided to check it out. With ample live counters for exotic meat, kulfi, and special ones set-up for festivals, a meal at B-Nation is usually an affair of pomp and gaiety. After you are seated at the table, the barbecue is set up and rows of starters begin to pour in. Right from chicken to seafood and mushroom to pineapple, several kinds of starters are served. With other non-barbecue options like crispy corn, potatoes, mutton sheek kebab (don't miss this), tangdi kebab, and more seafood delicacies, you can take a hard pass on the main course. 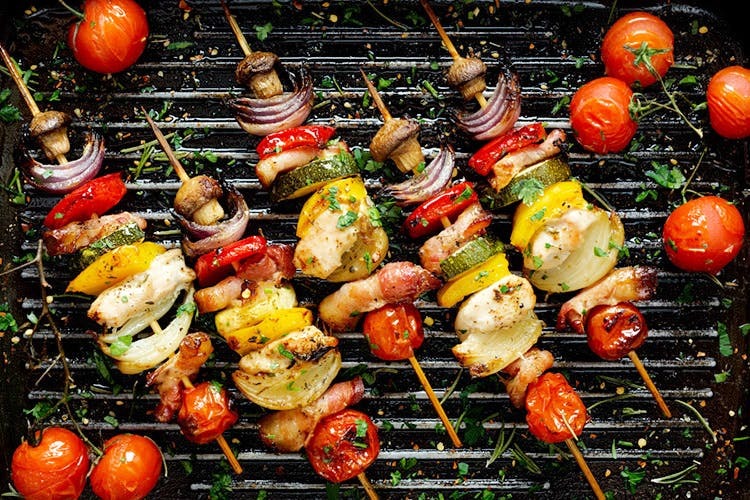 You’ll also be presented with an array of sauces and oils, so you can be your own chef and use a cooking brush to add jazz of flavours to your barbecue. The exotic meat counter has items like baby octopus, squids, eels, duck, rabbit etc. and you can ask for a mix of your favourite kinds of meats with the spiciest of sauces. If you decide to try the main course, which you should (because, biryani), cut the chase and try the dal makhni, crabs, and more seafood with rice and you’re sorted. If Chinese is more of your thing, find solace in noodles, Manchuria etc. Don’t forget to fill your tum with biryani before you head out to the dessert bar. You’ll find plenty of pastries, cheesecakes, brownies, phirni, fruits etc. but we go for a classic combination of vanilla ice-cream with gulab jamun and a plate of chocolate, and kesar kulfi. Be sure to make a reservation much in advance to avoid the waiting game.